Why should I have the truck tool box? What size to look for when buying truck tool boxes? What box type to choose? What tool box material is preferable? What about the weather resistance? You’ll agree with me that having lots of tools roaming at the back of your truck bed is one of the stressful moments as they can get stolen or exposed to harsh weather elements. If you store other gear alongside the tools, there is a high chance of your gear getting damaged by the tools. So, what’s the solution? With the best truck tool box, you can get your tools organized and protected. You will enjoy travelling to the job site knowing that the tools are safely and securely put in a rigid truck bed tool box. The market provides you with a variety of tool boxes to choose from, but that can be daunting for you if you’ve never used one before. Don’t worry, I have you covered with the best truck bed tool boxes on the market. I will save you lots of money as I have chosen the most affordable and durable products. Without further ado, let’s delve into the best tool boxes on the market. I have wrapped up the review with the buyer’s guide, which is aimed at equipping with the knowledge to choose the best truck bed tool boxes. As the name suggests, Weather Guard 127502 Black Aluminum Saddle Box is a perfect deal for weather resistance. We know that bad weather conditions, especially damp conditions can ruin the quality of metallic tools. They could, among others, experience rust especially if the tools are not weatherproof. So, having this tool box can make life easier for DIY’ers. Coming in a black aluminum finish, this tool box offers you a broad spectrum of features such as an advanced durability and lightweight. You’ll spend many years with the box mounted on your truck’s bed rails. It’s a saddle box, alternatively called the crossover, which means it hangs on the truck’s bed rails thus leaving more space underneath. If you still have to save some stuff in the truck bed, then this tool box could be an ideal solution. You will be able to store multiple tools in this tool box with its 11.3 cu.ft capacity. No matter how sharp or heavy the tools are, the box will not dent or deform, thanks to the strong aluminum metal. It attaches snugly on the bed rails. For more attachment options, I wish to recommend the CSI W35000 Tool Box Clamp which are also aluminum construction. You need no drills to install the box with these clamps. But note that the tool box’s installation is complete even without these clamps; I have recommended these attachments to add more security, especially when you drive in off-road terrains. If you often leave your truck unattended, it may be helpful to have this tool box with its extreme protection locking system to prevent any theft. It will deal with opportunistic thieves. So, in general, the tool box will help you against thieves and weather. Moreover, the box helps you organize the tools so you don’t spend so much time looking for your screws. It comes with the removable parts bin and the adjustable metal tray that make it convenient to organize tools. And, when opening the box, only a single touch of its automotive style rotary latch will you access to the tools. Left your electric tool with a flat battery in the tool box? No problem! The 12V power pass-through can help you charge on the go. My advice is that just make sure the box is compatible with your truck bed. Its height is 18.5 inches; width is 20.25 inches and the length id 71.5 inches. By looking at these dimensions, you should be able to put a wide variety of power tools as you get ready for your professional tool-demanding work. This tool box is expensive; but it is worth the value of money. For anyone looking for high-quality tool box, this could be the best option. I couldn’t find anything negative except the expensive price tag. But, looking at the features, the box is worth the price. Surely, corrosion will be a thing of the past. Again, no thief can tamper with your tools as the tool box comes with an extreme protection locking system. It protects and helps you organize your tools. I recommend it. Planning any family outing? 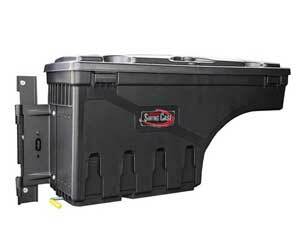 The UnderCover SwingCase Truck Storage Box could be the best tool box for your camping tools. It installs with ease just at the side of your truck bed without consuming much of the space. Unlike others that leave your truck bed with minimum space, this box ensures that you still have plenty of space to relax. The descriptive name of this tool box is self-explanatory in a sense that it tells what it does and where to install it. Unlike the previous crossover box, this one can be installed under the truck bed cover. A simple quick-release can give you access to your tools in a blink of an eye. It swings for easy access. Just note that it can only carry tools up to 75 pounds. You don’t have to spend the whole day trying to install a typical tool box. It takes you only 5 minutes to get this done using its 6 self-tapping screw. It also brings fun to the family with its cup holders on the top. Removing the box is also a cinch in case you want to give way to other equipment in the truck bed. Unlike the previous tool box, this one is not made of aluminum metal. So, you shouldn’t expect the same durability hence the manufacturer is only giving you a one year warranty. Typically, this tool box is for moderate tools. It is nonetheless strong with its ABS plastic material. Your tools are still protected against weather elements including thieves. The lid is lockable to safe your expensive tools. I like its portability that it can hang just below your truck bed cover. For budget-friendly purchases, you may consider buying this tool box. Whether planning an excursion or heading to the plumbing site, the box can hold your tools as long as they do not exceed 75 pounds. It is such a portable tool box that swings your truck bed cover. Also, installing it will not leave you with sweat. If you hold heavy tools, this tool box is not the best solution. Rather consider the previous aluminum tool box I have reviewed. If the first aluminum product overwhelmed with its expensive price tag, you can still find an affordable aluminum truck tool box. The Giantex 49″x15″Aluminum Tool Box is a perfect solution for those prioritizing durability and light weight in tool boxes. Its simple rectangular shape is not that attractive to me. Nonetheless, it fulfils its purpose of being one of the most durable yet affordable tool boxes. It measures 49 x 15 inches, which should be large enough for a broad range of tools. Install it at the back of your SUV or truck, or simply put in the garage. Your tools will not experience corrosion as this tool box is weather sealed to make sure that the contents remain as dry as possible. Coming with the tool box are 2 keys which help lock out opportunistic thieves from snatching your belongings. This feature is great if you used to leave your tools unattended for a prolonged time. Lifting this tool box should be one of the enjoyable hobbies. It comes with two handles at either side. The door is also easy to open or to close when you want to access your tools. Almost everything with this tool box is user-friendly. A beginner should be able to install it in a few minutes. By looking at it, you would be able to see that the box lies directly on the truck bed; we refer to such tool boxes as chest tool boxes. I’ll explain this category in the buyer’s guide. The manufacturer promises 100% satisfaction, and you may return it in case that satisfaction is not fulfilled by the tool box. This is an affordable aluminum tool boxes if you want a durable and lightweight truck bed tool box. It has a large storage space to store many of your tools without leaving the important ones outside. However, if you were looking for an attractive design like the preceding reviews, this one isn’t attractive to my eyes. It looks too basic. Nonetheless, I recommend it based on its great features and security at an affordable price tag. This is yet another portable tool box, but this time around made of polyethylene not aluminum. 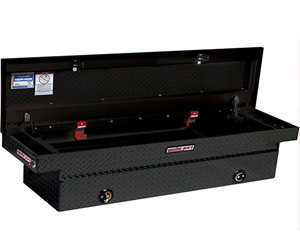 As in the name, Buyers Products Black Poly All-Purpose Chest lies directly on your truck bed to hold your tools. While this consumes much of your truck bed space, it ensures that your tools do not lie around. If you often carry multiple tools you’ll appreciate this tool box as it organizes your tools. It may not be a strong as aluminum construction but it surely protects your tools against harsh weather elements. Rainwater will not be a match to this polyethylene body, and so are opportunistic criminals. The lid locks securely to ensure that your tools are safe no matter how long you leave them unattended. With a capacity of 6.3 cubit ft., it is large enough to hold many tools even though it is not really the largest in my reviews. The box measures 44” x 19” and 17.25”; these measurements are important in ensuring that the tool box will fit perfectly in your truck bed. The good part is that a chest tool box will not obstruct the driver’s view like some crossover boxes do as it lies flat on the truck bed. Nonetheless, it takes much of the space. Even on the A-style trailers, this tool box can mount easily. It comes with stainless steel hasp and hinge which resist corrosion. Furthermore, the box is dent resistant and lightweight. It shouldn’t be difficult to lift and remove it from the truck bed. For most of truck owners, what matters is the storage of the tools as long as they are protected from the elements. This tool box will do just that. 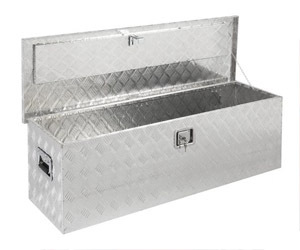 If you are looking for a more durable tool box material as aluminum and steel, this isn’t an ideal one. Nonetheless, it is still strong and can deter criminal activities with its secure locking system. Moreover, it is affordable and weather resistant. Last but not the least, I bring you one of the solid aluminum construction built to last for a long time. Yaheetech 30 x 13″ Aluminum Tool Box is a portable chest tool boxes that sits directly on your truck bed to help clear tools lying around. It organizes the tools to ensure that you find an exact tool for your job. Tools could get lost easily if not well-taken care of, so this tool box comes to your rescue. While this tool box is not the least in quality, it is certainly the least in inexpensiveness among others in my review. Very affordable aluminum construction that you could even mistake as a mediocre product. For a mere fact that 41 customers gave it 4.3 stars out of 5, it should be proof enough that most are satisfied with its quality. You need not be an automotive guru to be able to install this tool box. It installs easily more especially because it rests on the truck bed; so nothing is complicated with the installation. The good thing is that you need no drilling of holes. To keep thieves away, the box comes with the integrated lock and 2 keys. You may leave your tools unattended knowing that criminals will not tamper with them. Furthermore, weather resistance comes standard with the tool box. So, you do not really need the truck bed cover if you have this tool box unless you have other equipment stored that cannot fit in the tool box. Besides, the cover comes with other benefits other than weather resistance, so do not take my word for it. It’s your choice! If aluminum is your favorite material but do not want to break your bank, this tool box is the best for you. It is cheap yet still offering the best protection to your tools against weather elements and criminals. I would therefore the product to any enthusiast truck owner. Installing the tool box takes a few minutes, especially because it rests directly onto the truck bed. The downside is that it consumes more space, but it is nonetheless worth the price as it helps organize your tools. Let’s now delve into the buyer’s guide to help you choose the best product. I know how overwhelming it can be to choose the best tool box when given a plethora of them. There are important features you need to look for prior to making any purchase to ensure that you do not regret afterwards. I will go through the basic features worth-considering when buying the best truck tool box. Furthermore, I will answer the frequently asked questions. What features to look for when buying the best tool box? If you are a plumber, carpenter, farmer, construction worker or any professional who works in a tool-demanding workplace, you surely need a tool box. The box will safely and securely hold your tools while making sure that you access them with ease. The other reason that you should consider the tool box is that it benefits your image when approaching clients. They will see how professional you are and how serious you are with your work. Imagine losing an important screw just when you had to use it. This could reflect how disorganized you are. If you are traveling with no truck bed cover, your tools may be exposed to rainwater and eventually corrode. The tool box solves that. Even if you have the cover on, the tools may damage other equipment, so having the box containing them is indispensable. Furthermore, the tool box keeps away opportunistic thieves from snatching your expensive tools. The boxes come with the locking system to secure the tools. Most of these tool boxes are vehicle-specific, and so the biggest mistake other owners make is to overlook the importance of the size. Measure the width and the height of side walls of the truck bed to ascertain if the tool box will fit. Most importantly, make sure the tool box will be able to hold the type of tools you have. Consider the cubit feet capacity of the box and choose accordingly. One of the basic features to look for when buying tool boxes is the type of the tool box. The common types are the crossover and the chest tool box. There are other types such as sliding and side boxes even though they are not as common. Crossover box, also called the saddle box, hangs on the bed rails thus leaving some space underneath for an additional storage. Depending on the inches above the bed rails, these boxes can obstruct the driver’s view. So, choose wisely the tool box that levels with the bed rails to avoid the obstruction. The good part of the crossover is that it leaves more space in the truck bed. Oftentimes, the crossover tool box may prevent the installation of the truck bed cover. There are some exceptions. There are also swing cases that can be categorized with crossover as they remain suspended on the bed rails. But, they can be installed under the cover. Chest boxes are also common and are characterized by resting directly on the truck bed thus leaving little space. These boxes can install with ease under the cover. The good part of the chest box is that it does not obstruct the driver’s view at the back of the window. Sliding tool box can be installed on specialized rails. It can slide to and from to give you a quick access to the tools. These are not as common mainly due to their specialized installation as many truck beds do not come with sliding rails. Side mount tool boxes can give you more space in the truck bed. As the name suggest, they install on the side; you get to choose that which side to put them. These types are also not as common as the chest and the crossover boxes. Tool boxes come in different build materials: aluminum, polyethylene, steel, and stainless steel. Aluminum tool boxes – aluminum tool boxes are popular on the market, mainly due to the light weight and durability features of the metal. In some cases, aluminum may be finished with other coats. If corrosion and weather resistance are at the top of your list, then aluminum tool boxes are a must-buy. However, be prepared to pop out dollars to get these types of boxes. Steel – steel is also common in many tool boxes. In fact, steel has been used for many years before the use of other metals. Unfortunately, steel is not good in corrosion resistance. To compensate for that, it often comes coated to prevent rust and corrosion. Should there be any chip in the tool box, you might see yourself finding corrosion. Polyethylene material – plastic is also used in some tool boxes. While it may not be suitable for heavy tools as they can scratch or deform it, it is still the best tool box for moderate tools. For your outing activities where you want to store jumping cables or any other camping equipment, the plastic tool boxes should be sufficient. weather resistance is a priority to most tool owners. If the tool box is weatherproof, the tools will never be exposed to harsh elements and thus they will last. All the reviewed products above are water resistant. But, weather resistance differs from one material to the other. Stainless steel and aluminum are great in weather resistance followed by polyethylene body. Also worth noting is the lid construction of the tool boxes. Other lids are vulnerable to rainwater penetration at the seams. Look for that before you buy. Other tool boxes come with accessories such as the shelves or mini compartments to help you classify your tools. While these are great to organize your tools, they become useless if you have large tools as they will need a large compartment. Also noteworthy is the ease of opening and closing the tool boxes. This involves how user-friendly the tool box is. Other boxes come with simple, quick release latch systems to open or close. Look for such user-friendly tool boxes. The truck tool boxes are indispensable for professionals working with tools. They help you organize tools and to protect them against criminals. While there are many tool boxes on the market, not all can fit in your truck bed or fit your tools. So, choose wisely to avoid regrets. Moreover, these tool boxes come with lots of features. They are available in different types and styles. The mistake that many do is to choose based on the prices only; that could be bad for your tools. Consider how weather resistant and user-friendly the tool box is. I have reviewed the best truck tool box products from which I believe you can get your custom tool. The buyer’s guide further guides you on which features to look for. I've always had an affinity and passion for cars and the whole car culture. Sharing my guides, product reviews and useful solutions through my website. More about me.